2. Bring 1 cup stout and 1 cup butter to simmer in a large saucepan over medium heat. Add cocoa powder and whisk until mixture is smooth. Cool slightly. 3. Whisk flour, sugar, baking soda, and 3/4 tea. salt in large bowl to blend. 4. In another bowl, beat eggs and sour cream together with an electric mixer. 5. Add the stout-chocolate mixture to the egg mixture and beat just to combine. 6. Add flour mixture and beat briefly on slow speed. Using a rubber spatula, fold batter until completely combined. 7. Fill the lined cupcake pans 2/3 to 3/4 of the way full. Bake 17 minutes or until tester comes out clean. Cool completely on a rack. 1. Chop the chocolate and transfer it to a heat-proof bowl. 2. Heat the cream until simmering and pour it over the chocolate. Let it sit for 1 minute and then stir until smooth. This should sufficiently melt the chocolate — if not, use the microwave to help things along. 3. Add the butter and whiskey and stir until combined. 4. Let the ganache cool and thicken. Meanwhile, using a knife, cut out 1-inch circles in the cupcakes. Remove the centers of the cake, going about 2/3 of the way down into the cupcake. 5. Put the ganache in a piping bag with a wide tip and fill the holes in each cupcake to the top. 3. 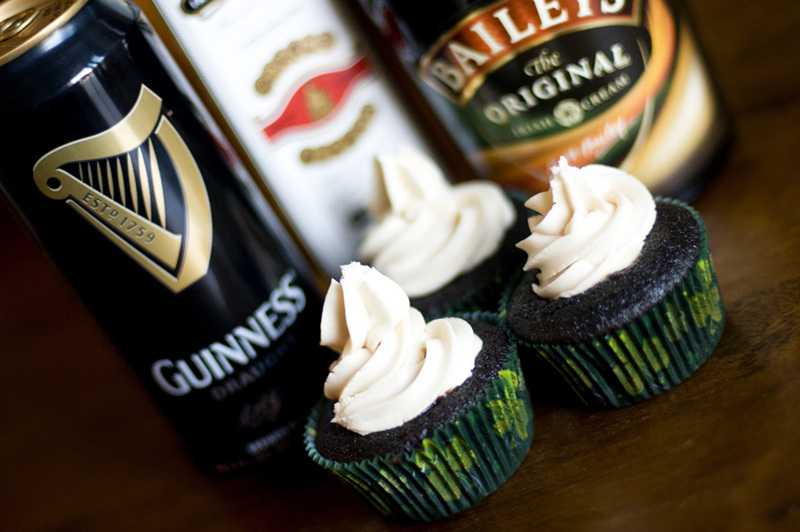 Add the desired amount of Bailey’s (or milk, if you don’t like Baileys) to the frosting to make it a little creamier. 4. Ice the cupcakes and decorate.